The digitizerNETBOX DN6.22x series allows recording of up to 24 channels with sampling rates of up to 5 GS/s and a bandwidth of 1.5 GHz. These Ethernet Remote instruments offer outstanding A/D features both in bandwidth and signal quality. The combination of high sampling rate and resolution makes these digitizers the top-of-the-range for applications that require high speed signal acquisition. The digitizerNETBOX can be installed anywhere in the company LAN and can be remotley controlled from a host PC. The digitizerNETBOX and generatorNETBOX offer a powerful GBit Ethernet connection and are fully LXI compatible. The netbox can be used as tabletop instrument or 19" rack mount operation. It can be connected anywhere in your LAN or directly point-to-point with your Laptop/Workstation. A full option package and software package including SBench 6 Professional is included. The first data acquisition can be done within minutes: connect power + ethernet + signals, swicth on, install software on client PC, detect the digitizerNETBOX/generatorNETBOX with Discovery, start SBench 6, do the first acquisition! The optional ABA mode combines slow continuous data recording with fast acquisition on trigger events. The ABA mode works like a slow data logger combined with a fast digitizer. The exact position of the trigger events is stored as timestamps in an extra memory. The FIFO mode is designed for continuous data transfer between the digitizerNETBOX and the host PC. The transfer speed is depending on the Ethernet connection between box and host and is in the region of 40 MB/s to 60 MB/s. The control of the data stream is done automatically by the driver on interrupt request. The complete installed on-board memory is used for buffer data, making the continuous streaming extremely reliable. The Block Average Module improves the fidelity of noisy repetitive signals. Multiple repetitive acquisitions with very small dead-time are accumulated and averaged. Random noise is reduced by the averaging process improving the visibility of the repetitive signal. The Block Statistics and Peak Detect Module implements a widely used data analysis and reduction technology in hardware. Each block is scanned for minimum and maximum peak and a summary including minimum, maximum, average, timestamps and position information is stored in memory. The ring buffer mode is the standard mode of all acquisition boards. Data is written in a ring memory of the board until a trigger event is detected. After the event the posttrigger values are recorded. Because of this continuously recording into a ring buffer there are also samples prior to the trigger event visible: Pretrigger = Memsize - Posttrigger. The data acquisition boards offer a wide variety of trigger modes. Besides the standard signal checking for level and edge as known from oscilloscopes it's also possible to define a window trigger. Trigger conditions can be combined with logical conjunctions like OR to adopt to different application scenarios. All boards can be triggered using a separate external trigger signal with a two level programmable window comparator and a second separate external trigger with a single programmable level comparator. It's possible to use positive or negative edge. An internally recognized trigger event can - when activated by software - be routed to a multi purpose i/o connector to start external instruments. The Gated Sampling option allows data recording controlled by an external gate signal. Data is only recorded if the gate signal has a programmed level. In addition a pre-area before start of the gate signal as well as a post area after end of the gate signal can be acquired. The number of gate segments is only limited by the used memory and is unlimited when using FIFO mode. The Multiple Recording option allows the recording of several trigger events with an extremely short re-arming time. The hardware doesn't need to be restarted in between. The on-board memory is divided in several segments of the same size. Each of them is filled with data if a trigger event occurs. Pre- and posttrigger of the segments can be programmed. The number of acquired segments is only limited by the used memory and is unlimited when using FIFO mode. The timestamp option writes the time positions of the trigger events in an extra memory. The timestamps are relative to the start of recording, a defined zero time, externally synchronized to a radio clock, or a GPS receiver. With this option acquisitions of systems on different locations can be set in a precise time relation. The internal sampling clock of the card is generated using a high precision PLL. This powerful device allows to select the sampling rate with a fine step size making it possible to perfectly adopt to different measurement tasks. Most other cards on the market only allow the setup of fixed sampling rates like 100 MS/s, 50 MS/s, 25 MS/s, 10 MS/s, ... without any possibility to set the sampling rate to any value in between. 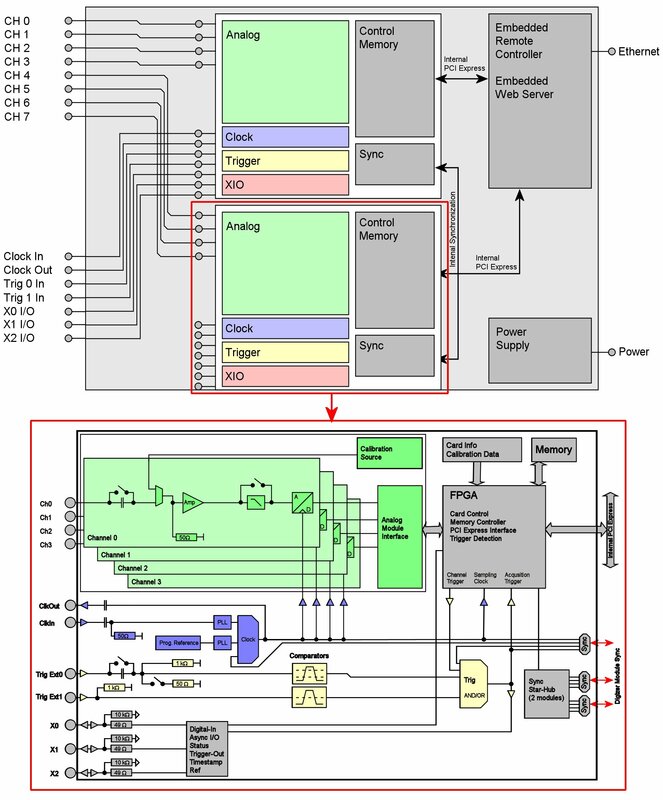 The option to use a precise external reference clock (normally 10 MHz) is necessary to synchronize the board for high-quality measurements with external equipment (like a signal source). It's also possible to enhance the quality of the sampling clock in this way. The driver automatically generates the requested sampling clock from the fed in reference clock. Each analog channel contains a software selectable AC/DC coupling. When using the DC coupling all frequency parts of the signal including the DC offset are acquired. Selecting the AC coupling will only acquire frequency parts of the signal that are above a defined minimum bandwidth. The on-board calibration can be run on user request and calibrates the amplifier against a dedicated internal high precision calibration source. After this calibration data is stored permanently in an on-board EEPROM and is automatically used for further acquisitions. The option (M4i.22xx-ir40m) for the high-speed 22xx series of digitizer products increases their input sensitivity and therefore absolute resolution for low amplitude signals in the ±40 mV up to ±0.5 V range. This option lets users select more sensitive, full scale ranges so that, even for low amplitude signals, the ADC's complete dynamic range is available. The analog inputs can be adapted to real world signals using a wide variety of settings that are individual for each channel. By using software commands the input range can be set to a value matching the real world signals. The high precision, high bandwidth 50 ohm inputs are optimized for acquisition of high bandwidth signals. All acquisition cards from Spectrum are built with a completely synchronous design. Every channel has its own independent input amplifier as well as an independent ADC allowing to program all input channel related settings individually for each channel. Each analog channel contains a software selectable low-pass filter to limit the input bandwidth. Reducing the analog input bandwidth results in a lower total noise and can be usefull especially with low voltage input signals. All M4i cards offer three universal multi purpose I/O lines, which can be separately programmed as either input or output. When used as outputs, these lines can be used to output card status signals like trigger-armed or to output the trigger to synchronize external equipment. A lot of third-party products are supported by the Spectrum driver. Choose between LabVIEW, MATLAB, LabWindows/CVI and IVI. All drivers come with examples and detailed documentation. Programming examples for C++, Delphi, Visual Basic, C#, J#, VB.Net, Java, Python and LabWindows/CVI are delivered with the driver. Due to the simple interface of the driver, the integration in other programming languages or special measurement software is an easy task. The digitizerNETBOX can be remotely accessed from any current Windows (starting with Windows XP) 32 bit or 64 bit system or Linux (starting with Kernel 2.6) 32 bit or 64 bit system by Ethernet. The remote access is done in the very exact programming like a locally installed product allowing to use any of the supported software packages. SBench 6 is a powerful and intuitive interactive measurement software. Besides the possibility to commence the measuring task immediately, without programming, SBench 6 combines the setup of hardware, data display, oscilloscope, transient recorder, waveform generator, analyzing functions, import and export functions under one easy-to-use interface. The product has 24 SMA connectors for the analog channels and seven SMA connectors for trigger, clock and auxiliary signals. Clock and trigger connections can be switched between input and output by software. Power cords and Ethernet cables are also available. Independent external pre-amplifiers allow to acquire extremely small signals with a reasonable quality. The external amplifiers are optimized for low noise inputs. The amplifiers of the SPA series are available with different bandwidth and input impedance options. No programming is needed to operate the amplifiers. The 19" rack mount kit extends the front plate of the digitizerNETBOX/generatorNETBOX to allow a mounting inside a standard 19" rack. The rack mount kit can be installed by the user.